A young casino that has modelled its aesthetic on the Roaring Twenties, The Grand Ivy gives off an opulent, stylish air and backs this up with a great game’s library. From the gold and black branding to the chandeliers, this is a website where luxury comes as standard. Behind the scenes, the gaming lobbies are mainly run by NetEnt software, and this means a huge catalogue of its titles are on offer, along with those from providers such as Betsoft, Leander, NextGen Gaming and ThunderKick. 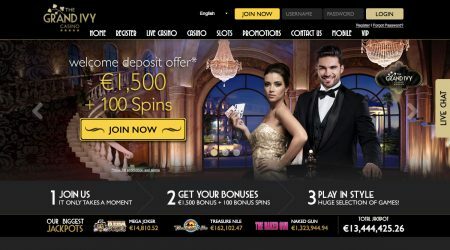 At the live casino area of the platform, the NetEnt stamp is also present, but it is joined by offerings from Evolution Gaming to add variety. Modern online casinos have to cater for the mobile market because so many people enjoy playing the slots as part of their morning commute, or when winding down in the evening when someone else is on the desktop. The Grand Ivy has made its service available to most mobile devices with a themed app that mirrors its vintage character. The décor is all in place, but clients won’t find as many games on their phone as they would on their PC, as not all the titles are supported. Nevertheless, there is a fair selection from which to choose. Browsing at The Grand Ivy is a genuinely enjoyable experience, as the menu is always in place at the top of the page and provides access to each area of the site. You can click on any of the options to move into that section and narrow a search further. Games and other elements are quick to load and play straight out of the browser, with no need for extra downloads. The Grand Ivy has a good selection of bonuses and competitions. One of the most popular is the £100,000 High Roller Tournament, which gives away cash bonuses and other prizes. To join in, players must place a wager on any one of the site’s Microgaming games. When they do so, they will be awarded with points – for each £25 that they wager, they get 1 point. At the end of the week, every Monday, the person who has accumulated the most points is in first place and the person with the second-highest number of points is in second place – this continues right down to the person in 501st place. The first prize is £10,000 and all five top spots win a smaller cash prize. Places six to 30 also win a cash bonus, while beyond this, free spins are awarded. Any new player who opens an account at The Grand Ivy is entitled to a welcome bonus. This is made available when they have registered for an account, logged in, entered their payment details and made a deposit. Once this is complete, any spins and bonuses are immediately credited to the member’s account and can be used. The total welcome bonus is £1,500, along with 100 bonus spins. This is made up of a first deposit bonus of 100% up to a value of £300, along with 25 spins on the Starburst game. The second deposit bonus is 25% up to a value of £800, along with 50 bonus spins on Aloha! Cluster Pays. Finally, the third deposit bonus is triggered when an account holder makes their third deposit, which is matched 50% up to £400, and 25 free spins are included for Gonzo’s Quest. Additionally, new members are given 500 of the casino’s loyalty points, which puts them on the road to earning a suite of cash prizes. To become eligible for this welcome offer, players must deposit at least £20, and the most that they can bet with their bonus funds is £5. The free spins can only be used on a specified game and must be taken within 72 hours. If the bonus funds have not been spent within 30 days, then the full amount will be forfeited. The practice at most online casinos is that once a player accepts their cash bonus, their balance is divided into two – the cash balance and the bonus balance. These remain separate until any wagering requirements have been met. It is often the case that different requirements are needed for different bonuses, but this will be made clear in the terms of each promotion. In general, players are obliged to wager 35 times the bonus they received before any funds are available as a cash balance. Sometimes, games will contribute to this total at different percentages and only certain games are considered eligible. To make the wagering requirements clear, if a player deposited £100 and received £100 as a bonus, then they will have £200 in their account. On the slots, they will need to wager 35 times the bonus amount, or £3,500, to meet the wagering requirements. The loyalty points scheme at The Grand Ivy is a regular promotion that awards players with points every time they place a stake. The initial deposit attracts a total of 500 free loyalty points, but after that, it is possible to earn 2 points for every bet of £10, though this varies between games. Once a member has collected 1,000 points, they can visit the My Account section for a £5 bonus. 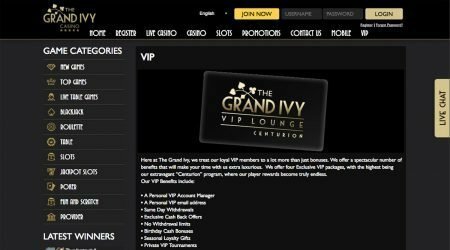 The VIP Package is widely promoted and delivers a suite of benefits to the players who are willing to bet larger amounts of money. Big spenders can look forward to having a personal account manager, cash-back offers, birthday bonuses and VIP tournaments. There are a few VIP levels for members to work their way through, but VIPs from other casinos will be fast-tracked. Any active players can take part in a regular competition to win a sports car, called The Grand Ivy Tour. To enter, they just need to accumulate 1,000 Ivy Points to win one Ivy Ticket. Ivy Tickets are not connected to any other promotion – they are just used in the Grand Ivy Tour giveaway. Ivy Points can only be earned at the Microgaming platform – every £25 wagered in this area is worth 1 point. When 30 players have reached the 1,000-point mark, the draw takes place. At the end of each month, the player’s Ivy Points balance is set back to zero. The games selection at The Grand Ivy is clearly dominated by slots, as they make up around 75% of the site’s offerings. 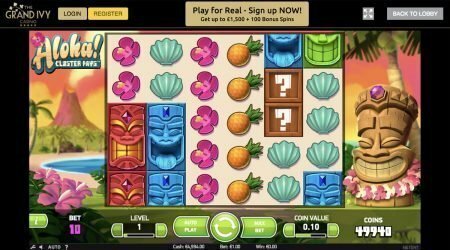 Players can browse through a wide selection from the movie-themed Jurassic Park game to higher earners such as Arabian Nights and classic fruit machine slots such as Fruity 7. Outside of the slots, players have the choice of casino or live casino games. In the Casino area, all the key games are covered with a fair range of video poker, some blackjack variants and some scratchcards, such as Irish Eyes. These are joined by arcade-style games, which are not numerous but do a great job of adding a little variation and fun to the proceedings. Everything is kept very simple and accessible to all levels of player – even people who are new to this casino. By choosing a glamorous theme for the website, The Grand Ivy has the opportunity to really go to town in the live casino area. From the Football Studio to the Live Roulette wheel, the sets look incredible and all the favourites are present, from Texas Hold’em to Caribbean Stud and Three Card Poker. The Live Gaming area is enhanced by the expertise of Evolution and NetEnt software, making this one of the best features of The Grand Ivy site. The Grand Ivy is keen to keep its customers happy and offers lots of payment methods. These include Mastercard, Visa, paysafecard, Giropay, Skrill and Neteller. Once a member has made a deposit, the casino will always use that method when authorising a withdrawal. It may not be as familiar as many other online casinos, but that should not put off curious players who want to try out The Grand Ivy. 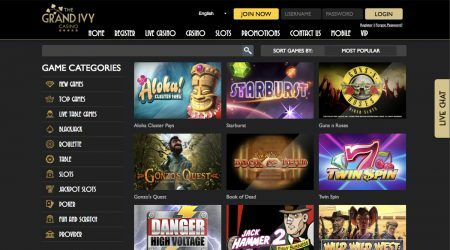 In a short space of time, the owners have gained a licence from the UK Gambling Commission, developed a great-looking site, and curated a collection of live, slot and casino games for their clients. The VIP perks will no doubt attract people with plenty of money to spend, and for everyone else, there is a welcome bonus upon which to capitalise. The Grand Ivy offers a fresh new angle with lots of choice for all. The customer service is excellent, and the casino accepts many payment methods. All types of player can find plenty to occupy themselves on this user-friendly site, and the promotions may just tempt them to return regularly.